If you use one of the preexisting RoutedUICommand objects for a WPF command, e.g. ApplicationCommands.Open, you’ll notice that the RoutedUICommand instance has a Text property. This property in the command is used to set the label appearing on any MenuItem instances that have attached to the command by setting their Command property. 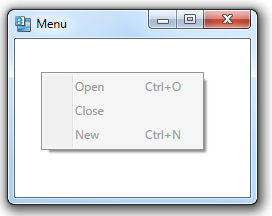 You don’t need to set the menu item’s Header property explicitly. Notice that the text for each menu item is automatically filled in, since the text strings are defined in the RoutedUICommand object. Also notice that some of the commands also define key gestures (e.g. Ctrl+O) for executing the command.